Karlskrona - in the middle of the archipelago! Karlskrona is a unique and exciting world heritage environment, where people come to meet, relax and be inspired. In Karlskrona, the distance is short between sights, and the city center is situated 6 km out in the archipelago! Here you will find exciting places to visit, nice shopping, cosy cafés and restaurants - and the sea is ever present. Discover new islands every day. Take the archipelago boat and explore exciting places together with the family. Did we forget to mention that the sun shines alot here? Karlskrona is truely the sunniest city in Sweden! Newspapers: Foreign newspapers are available at the city library. Opening hours: Shops are open Monday – Friday 10-18, Saturday 10-14. Department stores and food shops have generous opening times and are also open on Sundays. There is no end of things worth doing and seeing in Karlskona. You can visit many of the places of interest independently, others must be visited with a guide. Stroll the streets and experience the town’s modern day pulse blended with its historical spirit, a fantastic combination of past and present. The flagship of Karlskrona's attractions is The Naval museum - museum of the year 2015. Real battleships, 18th century figureheads, unique models and an underwater tunnel with a genuine wreck. Experience Swedish naval history at the Naval Museum in Karlskrona. For children there is Dunder’s deck and a sailors’ workshop. Since June 2014, the Naval Museum in Karlskrona shows the Swedish submarine HMS Neptun and the dive boat Hajen in the museum's new submarine hall. Highlights from the other exhibitions are ,The Museum Ships, The Underwater tunnel and The Model Chamber. Read more about the opening hours and special events at the museum, on the own website. Did you know that the most Swedish of all Swedish motifs, and perhaps the most widely distributed, is found in Karlskrona – on tiny Brändaholm? 43 red cottages with white corners, waving flags and a bright blue sea. And the motif continues to be spread across the globe as a representation of genuine Swedishness. Come and take a look at the real thing! Kristianopel, a small village with an exiting history, situatedabout 40 KM north from Karlskrona. There are small shops, restaurants and a popular cafe. Accommodation can be found at the camping ground, in the harbor, or at a Bed & Breakfast. To stroll around among the wooden houses, where the roses are heavy in the gardens, is the best way to experience Kristianopel. Feel the scents of roses and the sea. Sit down on a bench in the harbor and look out over the water where you can imagine Öland's southern point in the horizon. Come along on lovely guided tour out to Lindholmen, here you get to see some of the first pieces of Karlskrona's old shipyard. The heart of Karlskrona’s world heritage lies in the old shipyard, which has been left untouched since the 18th century. As Karlskrona as a city and naval base progressed most of the business was relocated to the new shipyard on Trossö. But the shipyard on Lindholmen was not forgotten, it has played a major part when it came to rope, reparations and maintenance of ships in Polhemsdockan - Sweden's oldest dry dock, which is still in use. So come out and enjoy alive historical environments with exciting buildings for you to enter. Do not forget to have a look inside the almost infinite rope making building, which is the longest wooden building in Scandinavia. 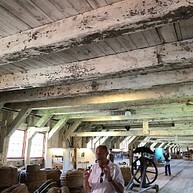 During the tour you are accompanied by a legitimate rope maker from VHFK (Shipyard historic compound in Karlskrona) who has great knowledge about how the shipyard worked back in the days. Info Gathering point - Högvakten, Karlskrona Language - Swedish & English Rope making is included Starting time: Saturdays between the 1/5-30/6 & 25/8-29/9 Between 14:30 - 16:30 Regular prices: Adult - 150 sek Youth between 7 - 19 years old - 70 sek Children 0-6 years old - Free Between the 1/5- 30/6 & 25/8-29/9 there is a special offer to buy a combined ticket for both "Kungsholms Fort" and a ticket for the "World Heritage walk in the Old Shipyard". Prices: Adult - 340 sek Youth between 12 to 19 years old - 130 sek Children 0-6 years, free. (The two tickets needs to be booked at the same time.) Tickets can be purchased at Karlskrona tourist office. Note! There's a limited amount of people that can visit Lindholmen at a time, so it might be good to book in advance. When you book your visit to the old shipyard, every participant will have to give away their full name, person number or pass number and also their nationality. For everyone older than 18 years old, you need to bring along some sort of id on the tour. This is solely a security matter, because the old shipyard is a restricted military area. Pets are not allowed on this tour. Mjölnareholmen is part of Karlskrona Cultural Archipelago, a whole new venture in the summer of 2018. The island where gunpowder was previously stored, will now open up and turn into a small family paradise. 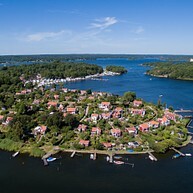 The activities at Mjölnareholmen island are open 30 June - 19 August. You can see children's theater, build your own dragon, fish or learn how to paddle the canoe. A small café is open on the island and the Gunpowder house is open for viewing. Exciting secret missions for the family! The summer-café is open every day between 11 and 18 and in evenings when there is events going on. Note! No cash-payments available on the island. Payment only by card or swish! To the island you go with the Hop-on Hop-Off boat, see the timetable below. Make use of the Right of Public Access - bring a basket for berries and mushrooms on your excursion. In Karlskrona there are 25 beautiful nature reserves - protected nature and protected species, and they show a variety of natural habitats - archipelago landscape, cultivation landscape, broadleaf woodland and conifer and mixed forest. Some examples of scenic areas are Knösö, Torhamn's udde and Södra Flymen. Whether you "just" want to enjoy nature's wonders and beautiful surroundings or be more active by running, cycling or paddling, you will easily find one or more favorites in Karlskrona's beautiful surroundings! Karlskrona Porcelain factory, manufactured beautifully feldspar porcelain, during the years 1918-1968, designed by famous artists such as Edward Hald, Percy, Alf Jarnestad, Sven Erik Skawonius and others. In parts of the old factory building, a large part of the production is shown in contemporary environments. In the Car Museum intermingled treasures from the past: luxurious automobiles together with the cars that everyone could afford, motorcycles, caravans, purpose-built cars and much more. 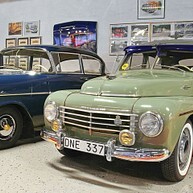 A unique collection enthusiast vehicles, linked to legendary drivers and car builder profiles. Neptun – a real submarine! The Naval Museum’s latest attraction, opened on the 6th of June 2014. 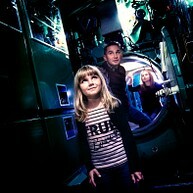 Experience a close contact with a submarine from the Cold War era, a dramatised boarding procedure and an inspiring exhibition for the whole family. 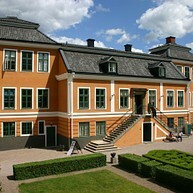 A museum with collected memories and traces of the history of mankind in Blekinge from the past 10 000 years. You'll also find temporary exhibits and a World Heritage exhibition at the museum. Boat to rent, Klaura and Camilla, two "Blekinge sailing boats", are moored at the quay just outside the museum (experienced sailors may rent them). The popular playground called, Grevagrundet, has an archipelago theme. 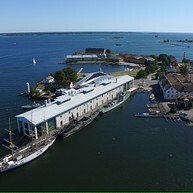 The former shipyard is now one of Karlskrona’s attractions and the basis of the World Heritage status. Here you will find, among relatively modern buildings, a variety of buildings and technology covering more than 300 years of shipbuilding. 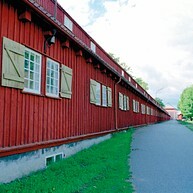 Visit the longest wooden building in the country, Repslagarbanan, the Wasaskjul, Polhemsdockan (dock) and Gallionslunden. There is also a tour that takes you to Lindholmen by sea. This shows you Karlskrona from the the sea side and takes you out to the former naval yard. You can only visit Lindholmen with a guided tour. During the summer there are regular tours, contact the tourist office to arrange tours at other times. Karlskrona Tourist Office - at your service! The tourist office will happily assist you with maps, give you a tip on current events, markets or other happenings in Karlskrona and it´s surroundings.. The tourist office is located by the (main square) Stortorget 2. Drottningskärs kastell (citadel) was largely built during the last decade of the 17th century and is considered one of Sweden’s foremost defence constructions, a complete and well preserved fortress from Sweden’s period as a great power. The citadel has a large castle keep in granite with gun deck, powder magazine and quarters. 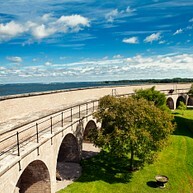 It has four bastions named after the queens Maria, Christina, Hedvig and Ulrica. Since 1895 Drottningskär has not played an active part in the Swedish defence system. You can get to Drottningskär citadel all year round via the car ferry to Aspö. The archipelago boats stop here during the summer. There is also a restaurant and café, open during summer. Interested in a guided tour during off-season? Contact the Tourist office. 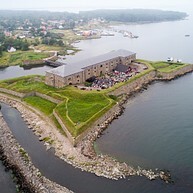 This fort has defended the entrance to Karlskrona for more than 300 years. Kungsholms Fort is still operational within the Swedish defences. The remarkable round harbour has become somewhat of a symbol for Karlskrona’s status as a World Heritage site. Exotic plants from all corners of the globe flourish under the protection of the fort’s walls. They have been brought here over many years on vessels returning from distant voyages. A museum on the island depicts the fort’s history. There are regular guided tours to Kungsholms Fort during the summer, visits can also be arranged for groups and individuals at other times. Contact the tourist office to make a reservation: +46 (0)455-30 34 90. Busfabriken - indoor play centre for children! Busfabriken - is an indoor play centre for children between the ages of 1 and 12. All children must be accompanied by an adult. Here in this huge facility with a jungle theme, children can play football and basketball in the multi-sport arena, compete against friends on the slides, crawl through tunnels and find there way past obstacles and giant balls. There is a separate section for the very young children with a ball-sea and a slide. Café with favourites for all ages! Open all year round.